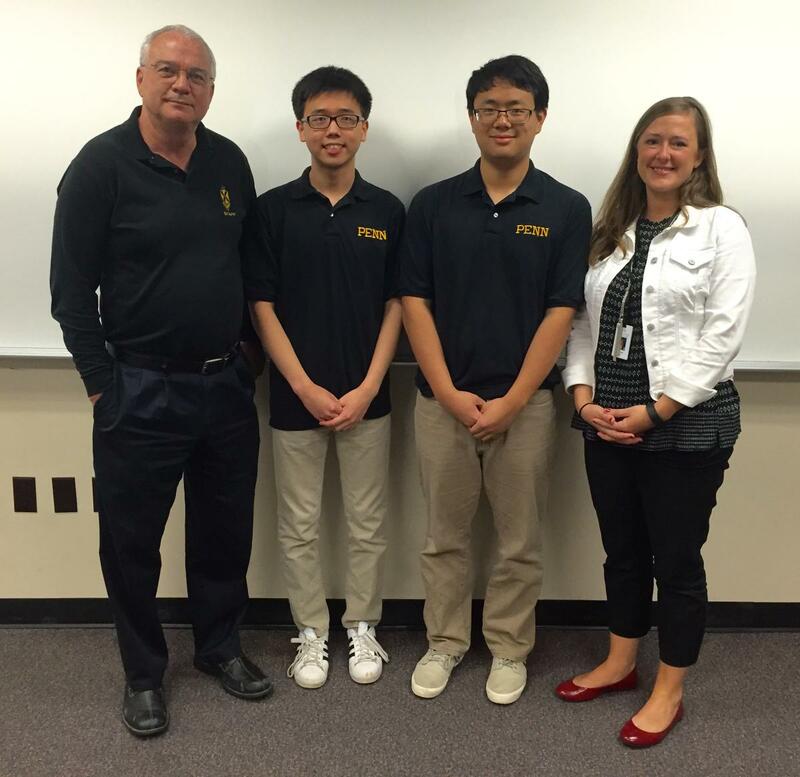 Penn Math Instructor Brad Grounds, MathCon 2016 national champions David Kim and Jack Bao, and Penn STEM Academy Leader Rachel Fry. Penn High School student Jack Bao said that it was just like taking another math test. Only this test was in a room of about 250 other high school students, and it was at the University of Illinois-Chicago. In their first year of competing in the prestigious MathCon national competition, Penn students made a masterful impact. Bao emerged from the grinding 40 problems in 40 minutes national finals competition as the 12th-grade national champion. David Kim won the national championship at the 11th-grade level. “These two students are national champions because of their level of commitment to the extra-curricular math programs at Penn High School,” Penn High School math instructor Brad Grounds said of Bao and Kim. Tina Lu was a ninth-grade Gold medal winner, Mason Lee was an 11th-grade Bronze medal winner, and Corey Wang was a ninth-grade Bronze medal winner. “Penn High school continues to produce successful students because of its promotion of these extra-curricular activities,” Grounds said. MathCon is in its eighth year. The national event started out as an online middle school competition, and added high school competition in 2012. This year, more than 45,000 students across the national competed in the initial online competition. The top 600 students were invited to the national finals in Chicago. Bao said that the Math curriculum at Penn gave him an edge in winning the national championship. Penn High School STEM (Science, Technology, Engineering, Math) Academy Leader Rachel Fry commended Grounds and all of the participating students from Penn.